SpeechLive Advanced Business Package allows for up to 10 users to be added to the Philips SpeechLive Service. Philips SpeechLive is your personal assistant in the cloud. The new dictation workflow service increases your productivity by allowing you to focus on your core business. You can now take full control of your entire dictation workflow, whether you are in the office or on the road. SpeechLive lets you upload, play and download dictation files, send them to your assistant or have them professionally transcribed using speech recognition software or a transcription service, which uses professional, industry-specific trained transcriptionists. The SpeechLive Small Business Package offers use of SpeechLive for up to 25 Users with 20GB / 100,000 min (DSS Pro) Online Storage. SpeechLive secures your dictations by encrypting them during recording, again when they are sent, and again by storing them in an encrypted format when safely kept in the cloud. This means end-to-end double encryption and protection from unauthorized access. Purchase a SpeechLive Advanced Business package for two users and receive subscription for one user absolutely FREE! Plus, you will receive 20 minutes of Speech Recognition minutes-per-month absolutely FREE! Take Your Free Trial Today! For online transcription, a professional transcription device such as a Philips foot control, the Philips hand control and a Philips transcription headset are required. SpeechLive is the ONLY completely secure end-to-end cloud based dictation service which allows businesses and individuals to send dictation and receive completed documents. With SpeechLive you can utilise the Philips Voice Recorder App on your iPhone or your Android Device and send your voice notes/dictation directly to your administration team via the Microsoft Azure Servers (this provides high level encryption for security and GDPR compliance). 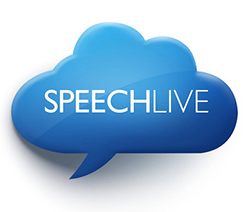 Alternatively, you can utilise the SpeechLive in-house services which include the Speech Recognition service at 23p a minute or the Transcription Service a 99p a minute â€“ great if you are unable to reach your admin/typist or they are out of the office. You can also upload your dictations directly through the SpeechLive portal which can be accessed online from any PC. Whats more, you can now plug a SpeechMike directly into your PC and take notes straight to the SpeechLive portal for your admin team to access. So basically SpeechLive offers you a multi-interface for dictation on the move. Whether you are looking to utilise your smartphone, your existing recorder or perhaps your desktop PC/laptop â€“ SpeechLive is the only cloud based solution which allows you that flexibility.